After services, join us for dinner and a lively literary presentation with Stephen Shepard, author of A Literary Journey to Jewish Identity: Re-reading Bellow, Roth, Malamud, Ozick, and Other Great Jewish Writers, in conversation with Michael Krasny, host of KQED Radio’s Forum. Dinner: adults, $24; students, $18; kids under 12, $12; kids under 5, free. In A Literary Journey to Jewish Identity, published in 2018, Shepard explores his encounters with several Jewish-American writers who inspired him and influenced his sense of what it means to be Jewish. He writes of the great flowering of Jewish-American fiction in the post-war era – the golden age of Saul Bellow, Bernard Malamud, Philip Roth, Isaac Bashevis Singer, Arthur Miller, Cynthia Ozick, and others. Stephen B. Shepard is the founding dean emeritus of the Graduate School of Journalism at the City University of New York. His tenure as dean ran from 2005 to 2013. Earlier, he served as senior editor at Newsweek, editor of Saturday Review and editor-in-chief of BusinessWeek. He was president of the American Society of Magazine Editors from 1992 to 1994 and was inducted into its hall of fame in 1999. His first book, Deadlines and Disruption: My Turbulent Path From Print To Digital, was published by McGraw-Hill in September 2012. 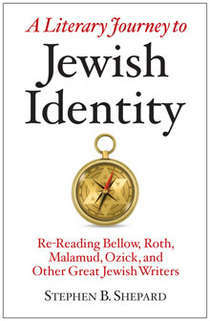 His second book, published in 2018 by Bayberry Books, is A Literary Journey to Jewish Identity: Re-Reading Bellow, Roth, Malamud, Ozick, and Other Great Jewish Writers. He and his wife, Lynn Povich, live in New York.